Want to keep your occupational therapy sessions fun and engaging when you’re stuck in the classroom? This (FREE!) 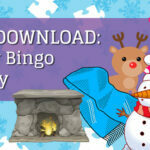 downloadable tracing activity (full of winter-themed pictures and words) might do the trick! What skills does this winter occupational therapy activity address? Tracing: Tracing is great for developing fine motor skills and building handwriting skills! And we know that kids will LOVE to trace and color these fun winter-themed pictures and words. Visual-Motor Integration (VMI): Effective, efficient communication between the visual systems and the motor systems is essential. Strong visual motor integration skills help occupational therapy students learn to perceive and copy shapes correctly – a skill they will need in order to correctly copy, draw or outline the winter objects in this activity. Special Note: Utilize this worksheet as a printed handout…OR, upload it into your TheraWeb online therapy sessions to use when providing therapy services to online therapy students. The TheraWeb interface has many great interactive tools students can use, including a pen tool, so that students can trace the objects directly on screen! Want to see a real cccupational therapy session online? Check out these videos! We hope you enjoy this free occupational therapy download, and are able to incorporate it into your school-based therapy and online therapy sessions. Be sure to share with friends and colleagues, and let us know your thoughts in the comments section below.